(Phys.org) —Researchers have developed a way for superconducting quantum chips to talk to each other over large distances through an optical fibre, allowing quantum entanglement or teleportation - both key steps towards building a truly global quantum internet via a quantum repeater. Devised by Dr Keyu Xia and Professor Jason Twamley from the ARC Centre of Excellence for Engineered Quantum Systems (EQUS) at Macquarie University, and Dr Michael Vanner at the University of Queensland, their idea makes use of the tiny magnetic fields generated by these quantum chips to alter the properties of an optical cavity, via a magnetostrictive material. A material that is "magnetostrictive" physically expands in the presence of a magnetic field. 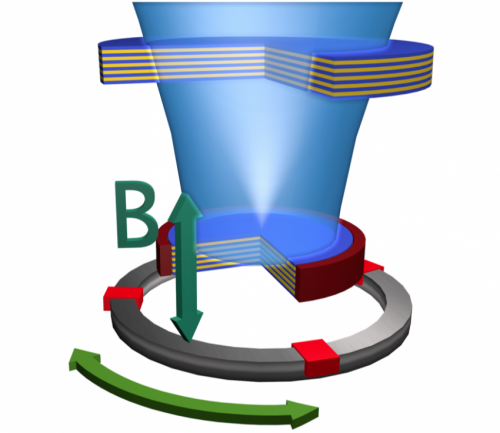 By using this, the team were able to show how the magnetic fields from the quantum chips can effectively speak via the optical cavity and connected optical fibre through to a distant superconducting chip in another lab elsewhere. "Quantum cryptography, the secret transfer of information over optical fibres that is protected via the laws of quantum mechanics, is one application of quantum science and technology that already has commercial applications," said researcher Professor Twamley. "This and other applications, such as quantum computing, quantum teleportation and quantum sensing, would benefit greatly from the ability to connect up quantum devices over long distance, for example, if they could plug in to a quantum internet. "Superconducting quantum chips are one of the most promising areas of development to become the hardware for tomorrow's quantum computers, and our superconducting/optical interface will help plug these chips together over large distances." high-speed optical telecommunications technology," said Dr Vanner. "It's a very exciting direction, quantum technology certainly has a bright future," said Dr Xia. Nice. Concise summary for us laypeople. I bet a lot of people will come up criticising the paper, but for many of us what's interesting / important is to give us a rough overview so that we can fit that into our broader image of reality.